Why are the majority of the comments (be it by LovinMalta or by Malta’s most influential sociologist Michael Briguglio or by the columnist Raphael Vassallo) focused mainly on the faults of the strategy of the PN’s campaign and not on its essence? What difference would have the PN victory made in terms of battling corruption? Why were so many people surprised by the PL’s landslide win? So, would have there been any difference in terms of corruption if the PN won the election? It is safe to say “unlikely”. The PN campaign did not truly challenge corruption nor did it suggest how it can be defeated. It only focused on the reputation of its opponents. It was not the quality or the long-term social impact of the PL’s policies that PN criticized but the public image of Joseph Muscat and that of the key figures in his administration. In a nutshell, the PN’s campaign claimed that “the reputation of Joseph Muscat became stained with corruption scandals and that threatens the reputation of Malta. Corruption scandals are detrimental to our economy because it will discourage big business from investing in Malta”. However, there was no single mention whether or not the businesses Malta is so reluctant to lose are themselves legitimate and ethical. Contrary to their own claims, the PN electoral campaign was NOT about battling corruption but keeping it away from too much exposure. 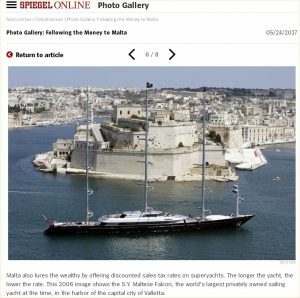 Malta’s financial services have become a regular feature in Der Spiegel. The 70 thousands offshore firms have already brought Malta to the attention of German authorities which will certainly not encourage entrepreneurs setting a company in Malta. 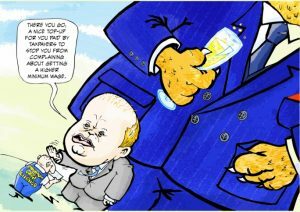 Certainly, the Panama accounts of Keith Scembri and Konrad Mizzi, followed by Egrant accusations, yet again brought Malta to the headlines, however, the criticism of “offshore banking and the legalised world of tax avoidance that Maltese corporate services providers are part of” has already been there. As MaltaFiles have revealed, “legal” does not mean right: Malta harbours companies with dubious records and the financial services in Malta are involved in dubious transactions on an unprecedented scale. In other words, the statements such as “I do not have an account in Panama” are laughable because, according to North Rhine-Westphalia finance minister Norbert Walter-Borjans, “Malta is a Panama of Europe”. Note – the criticism was addressed to the Malta’s tax system and its relationship with the financial services and not to the reputation of Malta’s key figures as such. The level of Malta’s relationship with corruption extends further than Panama accounts owned by a few Maltese high officials. The financial services in Malta carry out the same tasks as those in Panama – offshore banking which serves as a cover for money laundering and tax evasion for the ultra rich. Boasting a claim of moral superiority, did the PN challenge Malta’s love affair with the financial services and the betting companies? On the contrary, the main argument of the campaign was to airbrush Malta’s reputation in order to keep the shady businesses away from the international media spotlight – to camouflage the tip of the corruption iceberg. While the offshore accounts of Keith Scembri and Konrad Mizzi were condemned by the opposition and the members of the civil society, the offshore banking (read “corruption”) in Malta is being fiercely defended by the both parties alike. Such an attitude exposes the double standards: while opening an account in Panama is regarded a moral failure, Malta encourages this moral failure when it brings extra cash to the country. According to the PN, the Labour Party is not careful enough and has brought too much undesirable attention to the country’s relationship with corruption. The shady practices ought to be implemented hush-hush, discretely while the overall image of the country must be beyond reproach. In other words, the crystal reputation of Simon Busuttil fits best to safeguard the beneficial flow of corruption from further investigations and penalties. Apparently, keeping up appearances is necessary to help the country prosper economically. Judging by the same standards, if the shady businesses are so welcome to contribute to Malta’s economy, then the Panama accounts of Konrad Mizzi and Keith Scembri are mere contributions to the economy of Panama – almost a broad charity gesture. The businesses won. Daphne Caruana Galizia might have not realised that stirring further corruption scandals and investigations does not favour the country’s love affair with big business. Both parties rely heavily on big business, both are in the same boat, both will go down if the boat sinks. Businesses prefer calm waters and, luckily for them, the election result has made the status quo beyond reproach. Financial services and gaming giants do Malta a favour by not relocating to a different place (so far), meaning that the country will continue profiting off unethical businesses rooted in money laundering, thinning welfare of other countries and exploitation of vulnerable individuals. The election hysteria was not about morality and ethics but hypocrisy. The true ethically-conscious campaign would have challenged Malta’s relationship with the corporate services providers, tax avoidance and their rotten ethical foundations in the first place. Alas, such reasoning was not on the agenda. The PL’s smashing victory is surprising mainly to those who were not paying attention to the rapid changes the Maltese society is going through. The result is not as surprising as it might seem. There are two kinds of voters in Malta: the core and the floaters. These two groups made their choice for contrasting reasons: while the core supporters voted for the party assuming it did not change, the floaters did so precisely BECAUSE the parties have changed. Although the core voters would follow their party even if it suddenly started praising Holocaust, the roots of such loyal affiliation are far from ideological. The core voters are influenced by the memories of the treatment received from the parties in the past. The core PL voters support the PL in gratitude for its past standing with the lower and working classes and/or personal favours received from the party when it was in power – plots of land, jobs, promotions, housing etc. The core PN voters cling to their party for similar reasons – either for its devotion to Catholic values and/or resentment for the treatment themselves or their families received from the Labour Party in the 1980s. Not all core PN voters belong to the propertied classes – some low earners follow it in gratitude for its past personal favours or sentimental attachment to their seniors who would be the core PN voters themselves. Voters can be easily bribed by personal favours and handouts which is why candidates rely on house visits and coffee mornings when approaching the electorate. Doctors and lawyers make more successful candidates because they can trade some feasible services in return for a vote, unlike academics, for example. Sadly, the Maltese prioritise their private interests and care little for the interests of a collective. The core voters of both parties have more in common with one another than with the floaters: they simply refuse to admit that the parties have changed. 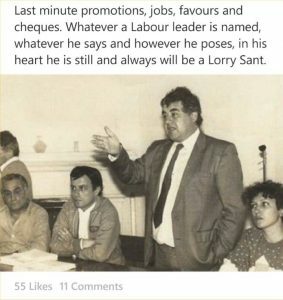 Although the Labour Party hardly justifies its name, to some die-hard Nazzjonalisti it still remains the same PL of the 1980s (“whatever a Labour leader is named, whatever he says and however he poses, in his heart he is still and always be a Lorry Sant”). The stubbornness of the PN zealots only reaffirms the merits of the Labour Party in the eyes of its core supporters and reinforces “the enemy of my enemy is my friend” line of thinking (“if they hate him, he still must be good for us”). Daphne Caruana Galizia’s blog is another helping hand for the PL because it portrays Joseph Muscat as though he is a clone of Mintoff. She openly flaunts class prejudice and insists on a specific interpretation of the corruption which she accuses Labour of: anybody coming from a low class background always remains morally inferior and is motivated by low concerns, thus the inferior species, who tend to gravitate towards PL, are not fit for governing and should never attempt at climbing up the social ladder. Her frequent remarks deriding the lack of proper manners and unsophisticated taste of the PL administration and the party supporters strengthen the false impression that the leaders and the common people are one. The snobbery and elitism of the PN works wonders for the PL. In fact, the latter needs a minimum effort to keep up a false display of the true leader of the common people – going to Serkin for pastizzi is enough. Never mind the reluctance to increase the minimum wage to match the increasing costs of living or a promise to clamp on social housing – so long as you have pastizzi on a paper napkin you are the voice of the people . The floaters, however, are able to see the parties for what they are at the moment. While the core PL supporters still think the party stands for their interests, the floaters see it as a “liberal, business-friendly force of modernization”. The decades of economic stability gave Malta a goldfish generation which never experienced significant economic difficulties and does not hold to the family’s past. They do not remember the thugs of both parties, nor do they remember the violent clashes between the core supporters of both sides. To be even more precise, they do not care for the past at all and do not feel obliged to be grateful or resentful for the past family affairs with the parties. What the young generation does remember though is the conservative times when the Nationalist Party was in power. The civil liberties introduced by the PL felt like a great leap and challenged the image of Malta as a conservative Catholic stronghold. The LGBTIQ rights, the introduction of a morning after pill, the promise of marihuana legalization outweighed the accusations in corruption. Besides, the career interests of Malta’s ambitious, individualistic and cosmopolitan young generation are better addressed by the PL. Not only had the PL continue cultivating business-friendly climate, they also encouraged the Maltese to take on their career ambitions and to climb up the social ladder. Unfortunately, the fact that Malta’s business-friendly climate rests on dubious ethical foundations is conveniently dismissed as “old-fashioned”. Individual ambitions and ethics are rarely part of the same package. Sadly, the unethical business ventures provide excellent career opportunities and hence they won as they would have won anyway. Follow MaltaSketches on Facebook. Not to miss any posts from MaltaSketches, click the button “Following” and then select “See first”. This will mean that your feed will always contain our posts. We only post a few times a month, so you won’t see too much of us. Grazzi!